Classic Max Pocket is a line of handhelds by Jungletac, initially VT-168 based and available in both horizontally- and vertically-oriented form factors (with different sets of games for each). This page covers the vertical version, which doesn't seem to have lasted as long as the horizontal, and instead gave way to the "HiQ Classic" line, with very few of its games being ported over. There are almost certainly multiple variations of this console (early promotional material advertises it as a 12 in 1) but the one I have is a 30 in 1 and seems to have been sold in Canada. The origins of the last 13 are less clear - the music is certainly more "Jungletacky" (for want of a better word) and many of them are ports of previous Jungletac games for different hardware, but it's possible Nice Code handled these ports from Jungletac sources too (especially since a couple of the title screens are done similarly to the NC-original ones). So as mentioned, this version has a vertical form factor and a portrait-oriented screen, which you don't see very often on handhelds. 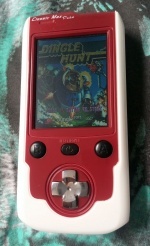 And I like that - it shows Jungletac were willing to try things a bit differently to the majority of console makers, and allowed them (or Nice Code) to develop a set of games uniquely designed to take advantage of the verticality (in contrast to another attempt at a vertical-screen handheld I've spotted on Taobao, which literally just takes NES games and stretches them). The console itself resembles a fatter, cheaper version of a 2000s-era mobile phone (which may well have been what they were going for). The button layout is a bit awkward - you basically have to take your thumb off the D-pad to access one of the buttons - but in almost all games both buttons do the same thing, so it's not really a problem. What is a problem is the lack of a pause button, though, something that seems to be quite frequently omitted from Jungletac consoles. Standard Jungletac - hold A and B when powering on. For the 30 in 1 version, it displays the version as 058A44A7, and if you press Up+A (and wait a few minutes) it calculates the checksum as 6861A096). This page was last modified on 14 June 2015, at 13:10. This page has been accessed 1,382 times.